There are loads of ways you can budget your money out there. Paper, Excel, Mint.com, checkbooks and so on. Personally, I’ve used a combination of these at one time or the other – but have mainly settled on an Excel spreadsheet over the past 3-4 years. I like it because I’m able to look over expenditures (I can tell what I spent at Target in 2011 OR what our gas bill was in December 2010) AND it gives me a 12-month view on one sheet. But I wanted to tell you about another budgeting software program out there too. It’s called You Need a Budget (or more commonly referred to as YNAB). It was started in 2003 by a fella named Jesse Mecham who was trying to figure out how to best stretch his dollars while he and his wife were broke, in college. I remember downloading the trial version of YNAB several years ago – but found it a bit too cumbersome and hard to grasp. And I never did like the features and functionality of Mint.com (basically because I didn’t really like a 3rd party program grabbing personal transaction data directly from my bank account) – so I was already a bit turned-off by “budgeting programs”. But over the past year or two, YNAB has really undergone a neat transformation – and seems very easy-to-use. 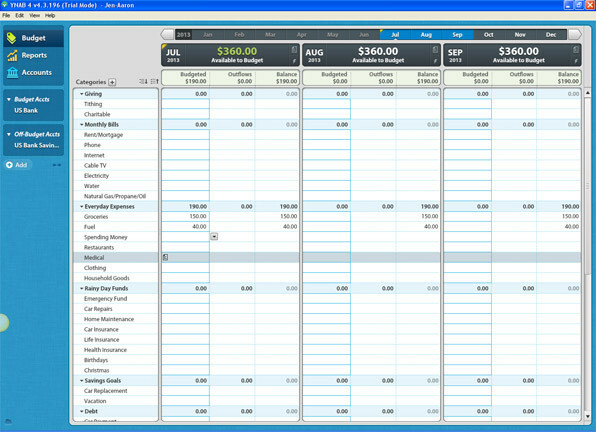 I love their interface and simple approach to budgeting and money management. You can easily just start using the program (by downloading the free 34 day trial version)- and there is no need to import any old data from previous budgets or the like (but you certainly can if you choose to). The program starts you off by asking what you have in your account today and then what expenditures you have coming up that will need to be paid before your next paycheck. 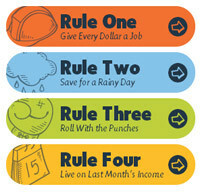 You give every dollar a home (or job – Rule 1) until your account balance is zero. It also helps you to start saving for other expenses that are upcoming (Rule 2) and allows you to adjust and change items as you go (Rule 3). The goal of the program is to get you to live off last month’s income (Rule 4) and to move you away from the paycheck-to-paycheck lifestyle that so many of us tend to lead. I would probably recommend YNAB to anyone who is just starting out – or trying to get some type of control of where their money is going and wants to get a handle on their finances. I’m not sure it’s the best solution if you are a budget wiz and are owning your money. The software is regularly priced at $60. Have you ever used YNAB or are you currently using it – and what has your experience been with the program? Is Rent to Own Ever a Good Idea? YNAB sounds interesting but I missed their sale cut off date by a week. Do you know how often they have a sale? In the interest of saving whatever I can, I’ll probably put off a purchase until them. Hi Louise – I’m not sure if / when they will have another sale. The price isn’t too bad ($60/license). Thanks. I’m with you too Thomas – but may try er out more in-depth for a month and then do a follow-up review. Never saw or heard of YNAB before this review. Sounds like a nice piece of software for those who like software for budgets. I am still old school in this aspect and use good ole excel spreadsheets and sometimes paper and pencil. I like the review but would have really enjoyed some of the con’s if they had some.